A year of self #5 – Cookie! Daughter and I usually bake cookies for the holidays but this year work schedules conspired against us. One of our standards is a delicious Ginger Spice refrigerator cookie. We’ve used the recipe so many times, the cookbook opens automatically to the dough-stained pages. We love them, and I really missed not getting my fix this year. So imagine my surprise today when I walked into the break room and saw a baggie full of what appeared to be my favorite holiday cookie! Their size, color, and sugar-coated cracks caught my attention right away and a quick nibble confirmed what my eyes beheld. Of course, I had to eat more than one! 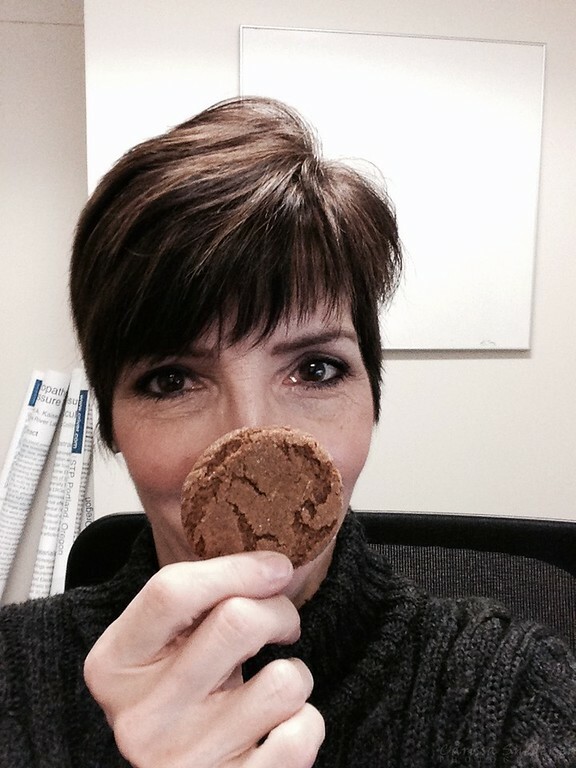 This entry was posted in 365 Project, A Year of Self, iPhone, Office Space, Self-portrait and tagged cookie, happiness, surprise. Bookmark the permalink. This was my second one. The first didn’t even make it out of the break room! No Cookies were hurt in the making of this shot…..maybe, but I bet it didn’t last too long afterwards!